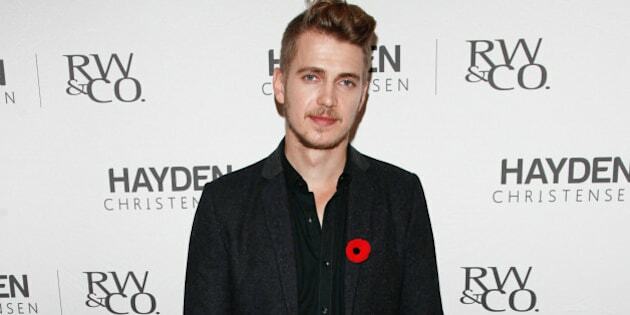 Only Hayden Christensen could bring together the nerd herd and the fashion crowd together. The "Star Wars" actor was in Toronto on Wednesday for the media launch event of his menswear collection with retailer RW&Co. and brought his style A-Game which impressed the city's fashionistas. The 32-year-old sported his new haircut (shaved on the sides, pompadour at the top) and wore a sleek black blazer and matching tee along with mustard yellow baggy trousers and trendy sneakers. Christensen so impressed the city's fashion elite that they took to Twitter and Instagram to express their excitement over the Canadian's collection and, of course, his good looks. But despite the impressive showing, there was one important piece that was missing: Hayden's stylish girlfriend, Rachel Bilson! While it's too bad the former "The O.C." star wasn't able to be there for her man, Hayden seemed to be able to manage all by himself. The partnership with RW&Co. is the actor's first design collaboration and will debut in stores and online on Nov. 7. What do you think of Hayden's casual style?